I asked the seller a question re naming Orzel as the maker. This trader has four Ti Toki listings .... all attributed to Orzels by the way. An interesting looking small crude looking Ti Toki bottle too. Nice one and he looks like the 'real' Ti Toki. Ummmm? Black/brown from memory, they're quite macabre looking - you'll have to check when he gets there. 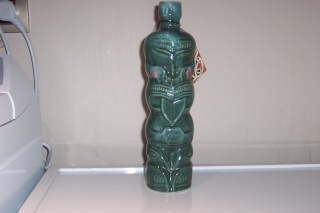 The Ti Toki bottles are very popular and are usually sold as being made by Crown Lynn. Twice in the last couple of weeks I have seen references that these were made by Orzel Potteries. One reference even gave specific dates - 1979 to 1983. So did Crown Lynn make the early bottles? Wish I had a photographic memory!!!! I love the paua eyes!!!! Strange to have a number painted on the base in white though don't you think? eibet knew that they weren't Crown Lynn, but didn't say why unfortunately! kathy made some interesting comments ..... it sounds like she had a Hobby Ceramics studio where the students buy the greenware and then glaze it ....? There have been so many auctions lately saying that Orzels made the ones they have listed ...... now I want to see a Crown Lynn one !! Tony sent me one ..... it has very sad drippy eyes .. there is a photo up above. Just checked the listings on TM and it looks like the numbers are written through the glaze - hence the white numbers. ti toki has been made my many potteries over the years and is still being made today same of the potteries put a date and batch number. the new ones have the paua shell eyes . You can find them for sale in the duty free. Do you know if Crown Lynn made them? If they did, how would you be able to tell? It never works when I ask more than one question in a post, but here goes anyway..
Who else made the bottles and when? Do you know who the modeller for the moulds was? When were they first made? crown lynn made the screw top ones and Cameron brown made them and larry in view rd henderson made them. It's a bit like the chicken and the egg the answer is out there . Try the Ti Toki owner. Once upon a time there was a lot of info about the history of the Ti Toki bottles on the net, which seems to have vanished now and I never thought it would disappear, so never recorded any of it and can't remember much at all other than Glen Eden being one of the places that they were manufactured. As I'm not sure how long those threads stay around I will add some of the info that kalevala added. 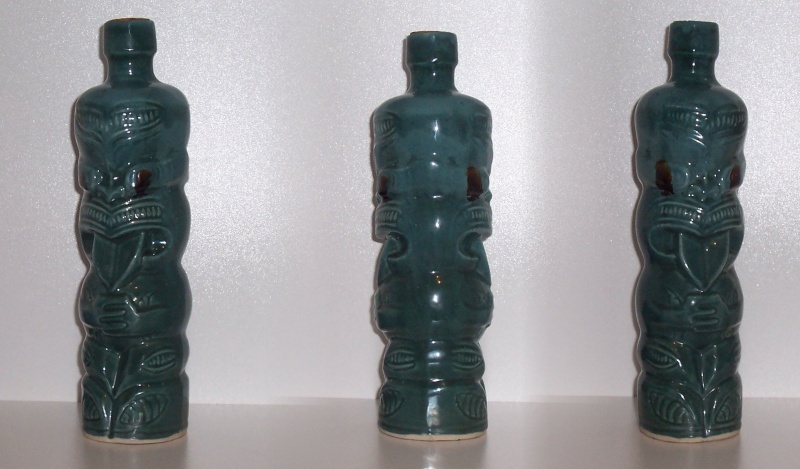 Orzels made the Ti-Toki bottles from 1979 to mid 1984 in brown and jade green. Crown Lynn Ti-Toki bottles have a screw cap and are smaller and made them from mid 1984 to when the Ti-Toki company was first on-sold. After searching for info I found a screw top bottle from an old TM listing and it had measurements of 26cm. One listed with a cork had measurements of 30cm. Another old listing said that Hemara Hemara was the modeller. Some have the year made scratched through the glaze like the one posted above, which reveal that they have been made during Orzels manufacture. So would this Ti Toki bottle have been made by Crown Lynn? Can't see any stand out differences. I noticed that one too. The first time I have seen one marked so clearly as to the maker. I was talking to Peter Rogers at Real Time on Sunday and he mentioned that he had had some beakers at one time that he thought matched the Ti Toki bottles. The only thing I can think of his Hemara's Titian "experimental mug"
http://www.newzealandpottery.net/t665-experimental-titian-hemara-design-mug#1658 but Peter did specifically say "beaker" and any resemblance to the mug is superficial. but I am only familiar with the 1334. There are some small air new Zealand beakers, but we don't have any on the site yet. Heather put a link on from some that are in Te Papa's collection and I will try to find it later. I've tried several times to win the odd one without success. I've had a look and I think it likely these are what he was talking about.